Arkansas is on the rise with local breweries. We've got some awesome stuff here. But, today, I'm going to focus on just one -- Ozark Beer Company. Located in Rogers, this brewery has been pumping out some amazing beers. In fact, according to Beeradvocate.com, their Bourbon Barrel Aged Cream Stout, is the #1 beer in Arkansas, and rated as one of the top in the United States. Unfortunately, since they make such a limited amount, we only saw about two cases in the store. However their main-line brews are some of my favorite local beers! This is an incredible beer. A light, easy-to-drink pale ale that is a perfect sessionable at 4.3%. You get some nice citrus on the nose, followed on the palate with some rye spiciness. This beer could be considered as sessionable with an ABV of 5.3%. Made from hops sourced from a single farm in Oregon, this one has strong aromas of pine and grapefruit that follows on the palate. This is a pretty classic American IPA that is true to the style. This is my favorite beer from Ozark! A perfect example of a Belgian golden ale, they use the traditional Pilsen malts and Noble hops. On the nose, you get some grass, spice, and pear notes. I definitely recommend that if you haven't had this, give it a try. A perfect, low ABV (5.3%) stout! This one has very strong notes of coffee and chocolate, that follows on the palate with a nice roasted malt finish. I think the brewers say it best, "A perfect beer for the cooler weather." I imagine this is going to be a mainstay in my fridge this fall and winter. 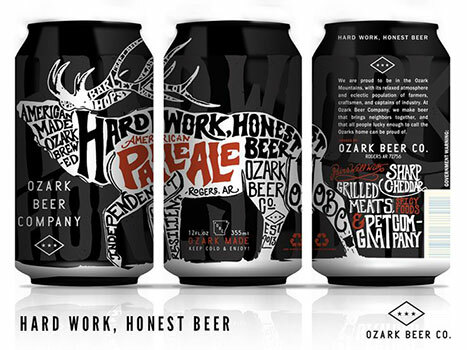 If you didn't know about Ozark Beer Co. before, you have no excuse now! With this brewery being in Northwest Arkansas, it gets overshadowed by our regional locals, much to my displeasure. Come by and grab a six pack of one of these awesome beers and as always, you can follow us on UNTAPPD at Colonial Wine & Spirits to see what we have to offer and my personal UNTAPPD (jliddy09) to see what beers I've been trying lately.